If you've recently bought a new Mac laptop, the last thing you want is for it to get stolen. Apple doesn't really offer any monitoring program to protect your MacBook, so iAlertU comes as a blessing. This open source program makes smart use of both motion sensor and iSight to protect your MacBook. Once activated, it will trigger an alarm as soon as your MacBook is moved or your keyboard/trackpad is touched. 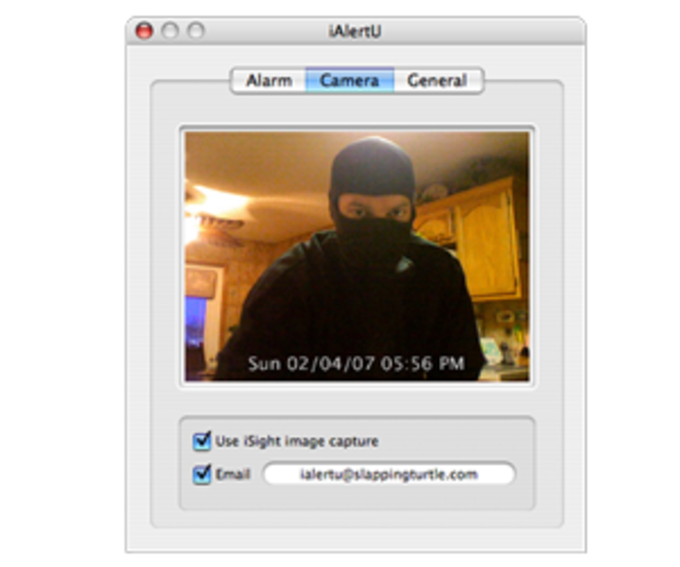 It can also automatically take a snapshot of the robber with the iSight camera and send it automatically by email. iAlertU is very easy to use and can be activated just by using the Apple Remote. 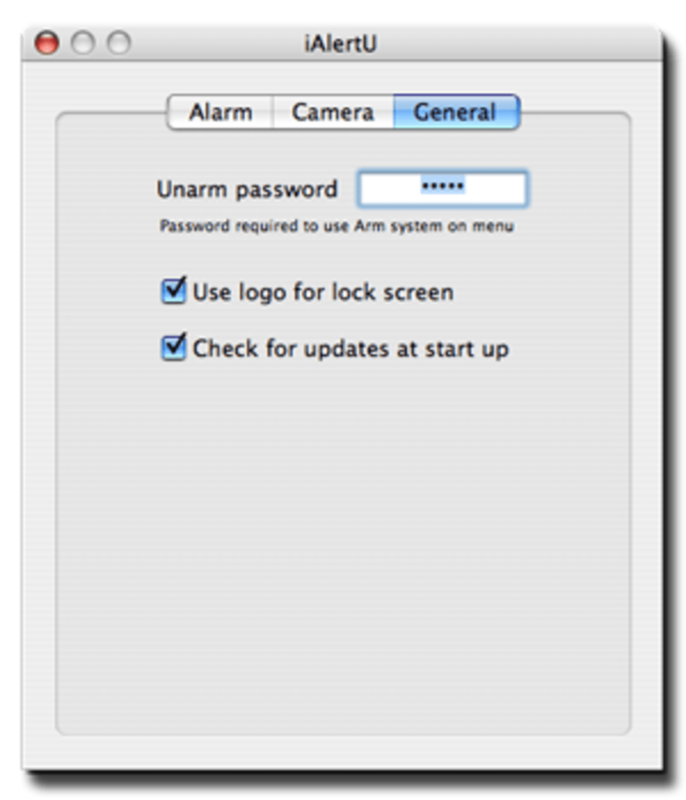 You can access all it's settings directly from the menu bar and choose what sort of alarm to trigger. Obviously you'll have to choose well when to activate it, as you don't want the alarm to go off every time someone gets close to your Mac. New alarm sounds have been contributed and the existing sound has been cleaned up. iAlertU is the first of its kind alarm system for your Apple MacBook computer. 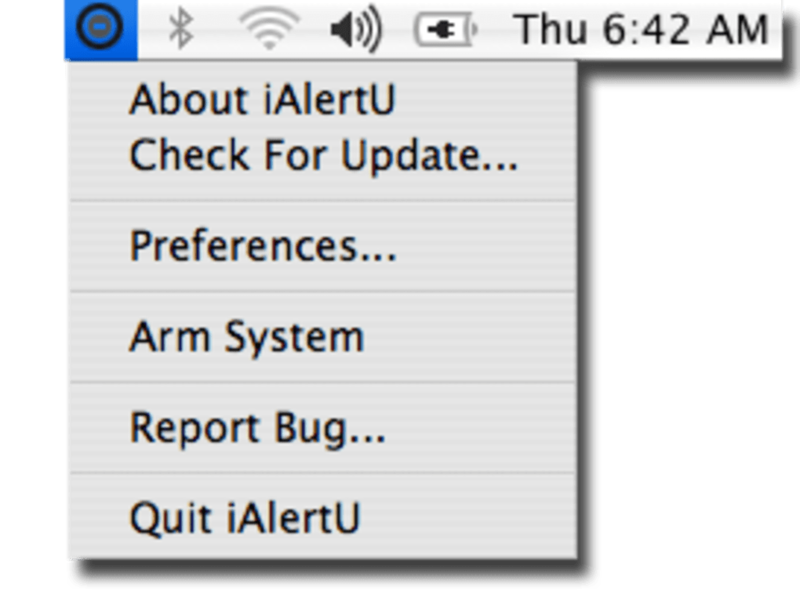 Basically iAlertU is a car alarm for your Apple Mac. iAlertU uses the built in sudden motion sensor (SMS) device to detect movement of your Apple MacBook and triggers an audible and visual alarm. 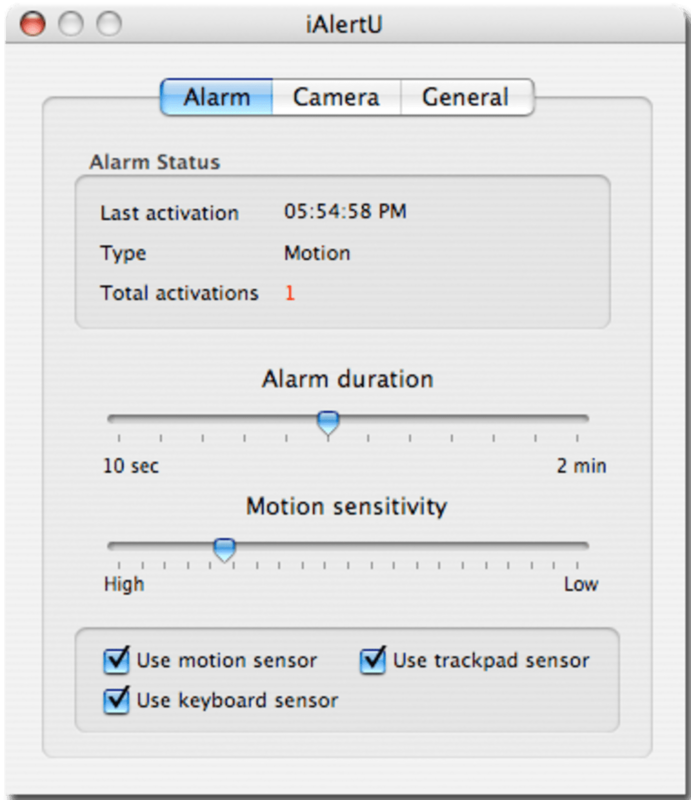 The alarm can also be triggered by keyboard and mouse/trackpad movement. The alarm is designed to continue sounding even after the Apple MacBook screen has been closed. iAlertU is activated and deactivated using the infrared remote control included with every Apple MacBook computer. User adjustable settings let you decide which type of alarm triggers you would like to use, the duration of the alarm, and motion sensor sensitivity. iAlertU also features functionality which utilizes the built in iSight camera to photograph the would be thief and then email the photo to a user specified email address. Works pretty good. This program works great. It's easy to set up and install. I do wish it was louder and not be able to shut down the software. Can easy shut down the program. A few Bugs. I love the concept but I have two issues; 1) Once installed I couldn't find the program. It ends up I had too many icons in the top bar of my mac. So I shut some down and opened a program with a short menu and then I found the 'Stop' sign icon. You need that to set password and other preferences. 2) This issue is preventing me from using it, I can't disarm without shutting the machine and rebooting. On the reboot I can enter my ialertu password and turn the alarm off. Without a remote I can't figure out how to turn off the alarm once I have armed it. I enter the password on the keypad and nothing happens. Amazing software if they can get these bugs fixed. - Lots of configuration choices. - easy to use menus. - difficult to find the program once installed.